The human brain is a fascinating and complex organ. The brain is so complex that it is not possible that one or two isolated substances could possibly optimize nutrition for it. That is why Serious Brain Enhancer contains a combination of high nutrient foods and food extracts to provide some of the most complete and comprehensive support available anywhere. An optimally functioning brain is needed for an optimally functioning life. An optimally functioning brain has an excellent memory, can learn, can focus, is not depressed, and maintains proper mood. Note: Other than a wild salmon extract, all glandulars in this Food product are ovine from New Zealand. Acerola Cherry is one of the most vitamin C dense Foods. Not only does it have free radical scavenging abilities, it also has been shown to increase the antioxidant abilities of some other foods (1). “Alpha-Lipoic Acid, also known as thioctic acid…is a potent biological antioxidant” (2). Studies have concluded it helped aged mice improve memory (3), protects the brain from cerebral ischemia-induced reperfusion injury (4), that it counteracted glycollate-induced free radical toxicity (5), and that it had neuroprotective effects against ischemia (6). “Alpha lipoic acid is actually the most efficient way to help the body produce glutathione (7). Choline is a required nutrient which is needed for the normal development of memory (8). Corn Silk is normally used for the kidneys or liver (9), but appears to have synergistic properties for brain support. Deoxyribonucleic acid (DNA), along with ribonucleic acid (RNA), act as ‘memorigenics’ (10). Eleuthero Root, once known as Siberian Ginseng,is an herbal adaptagen. “Siberian ginseng is used as a tonic for invigoration and fortification in times of fatigue and debility or declining capacity for work and concentration, and during convalescence” (9). Flaxseeds contain 30-45% fatty oil--this oil consists primarily of linolenic acid (40-70%), linoleic acid (10-25%) and oleic acid (13-30%) (9). “Flaxseed oil can provide the body with ample quantities of the essential fatty acid omega 3, which is transmuted into another fatty acid and ultimately provides nourishment for the brain cells” (11). Grape Seed Extract provides the richest source of oligomeric proanthocyanidins (OPCs) that is able to pass the blood brain barrier. Some consider OPCs an ‘anti-stroke’ nutrient which “keeps collagen elastic and softens blood platelets” (11). OPCs have anti-oxidant effects (2); OPCs enhance the brain by encouraging vascular efficiency. Inositol “can help alleviate anxiety by acting as a natural Valium minus the side effects” (11). L-Carnosine has antiglycation effects and has been proposed as an ‘anti-aging drug’ (12). Some believe it may be helpful to prevent complications associated with Alzheimer’s and other dementias (12). L-Methionine is an essential sulfur amino acid which easily passes the blood-brain barrier where it is converted into S-adenosylmethionine (SAMe) (13). A study involving Parkinson’s found that it improved activity level, ease of movement, rigidity, mood, sleep, attention span, concentration, voice, and muscular strength (14). L-Tyrosine has an effect on nerve impulse transmission and may “improve vigilance and lessen anxiety” (15).“Tyrosine and phenylalanine promote the production of dopamine within the brain, a vital compound responsible for regulating the operation of neurotransmitters” (11) (phenylalanine is naturally in ovine brain (16)). “Lecithin is a type of lipid that is needed by every cell in the body…The protective sheaths surrounding the brain are composed of lecithin…Lecithin consists mostly of the B vitamin choline, and also contains linoleic acid and inositol” (17) in the forms of phosphatidylcholine and phosphatidylinositol. “This nutrient…improves brain function” (17). It also contains phosphatidylethanolamine. OvineGlandulars products are a Food believed by their proponents to provide nutritional support for the corresponding gland in the body (18-21). Glandular organs have been apart of the human diet for centuries (22). Glandulars contain nutritional peptides, enzymes (when freeze or vacuumed-dried), and other tissue substances (18-21). Glandular substances may reduce aspects of cellular atrophy, degeneration, decreases in tissue elasticity, and other negative aspects associated with aging (21). Brain glandulars contain “specific brain cell activators” (23) and have been advised for slowness of thought, loss of memory, uncontrolled mental activity, nightmares, mental retardation, and epilepsy (24,25). A double-blind study involving bovine-brain derived phosphatidylserine found it was able to improve both behavior and cognition in elderly people with cognitive decline (26). “...phosphatidylserine enhances the ability of enzymes in membranes of nerve cells to relay messages in and out of the cells. This product can improve memory in older adults, and can ameliorate symptoms of depression” (11). Research suggests that the glandular source phosphatidylserine is more effective than soy isolate sources (27). Pituitary glandulars have been used for nearly a century to provide nutritional support for people with problems such as mental retardation, slowed growth, Down syndrome, epilepsy, loss of memory, developmentally delayed children, premature senility and other situations (23,28). Trachea naturally supplies chondroitin-sulfate A. Early research indicated that ruminant source glandulars (bovine, ovine) were better for humans than animal sources (21,29). Ovine brain tissue naturally contains about 1.0% methionine, 2.4% phenylalanine, .5% tryptophan and 1.8% tyrosine by dry weight (16); other ovine glands have a similar amino acid profile. Selenium in Food has been found to be about twice as well retained as other forms (30). Vitamin B6 deficiencies of vitamin B6 can eventually lead to symptomatic memory problems (11). Higher plasma levels of vitamin B6 do seem to correlate to better memory in the elderly (31). Even children with learning problems have been reported to respond to vitamin B6 (11). Vitamin B12 can prevent certain dementias and assist mood (2,32,33). 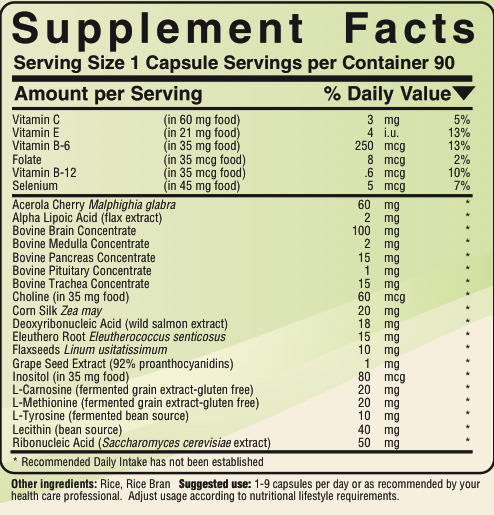 Vitamins B6, B12, and folate all appear to assist memory function (2,11,32,33). Vitamin E in Food has about 4.0 times the free radical scavenging strength of synthetic, non-food vitamin E (34). Vitamin E has antioxidant abilities and appears to have positive effects on preventing certain forms of cognitive decline (2,33). Food Vitamin E has been proven to have 12 micro moles per gram T.E. of lipophilic ORAC (oxygen radical absorbance capacity) —ORAC is essentially a measurement of the ability to quench free radicals (antioxidant ability). It is interesting to note that so-called “natural” forms (like succinate) such as do not even work like Food Vitamin E—Even the PDR notes, “d-Alpha-Tocopherol succinate itself has no antioxidant activity” , so why would anyone want that for their vitamin E supplement? It is no wonder, once they know the science, that professionals interested in optimal natural health recommend Food Serious Brain Enhancer as the preferred Food source for comprehensive brain nutrition. 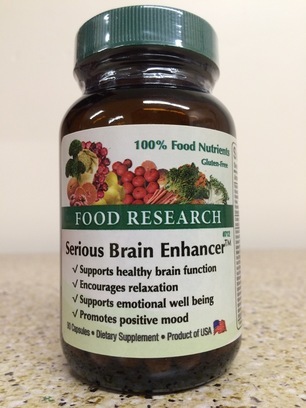 Unlike many so-called “natural” formulas, Serious Brain Enhancer is only comprised of foods, contains no synthetic USP vitamins or isolated mineral salts, but only contains foods, food concemtrates, and food extracts.